I can sing the praises of Vientiane’s affordable, delicious, vegetarian-friendly Laotian cuisine all the day long. I have never had a dish at this neighborhood BYOB that I didn’t like, and often I love whatever I ordered so much that I get in a rut, and can only order that exact same thing for months (sometimes years). So it’s a big deal when I break the mold and order something different. But this King Soup caught me eye – it was exactly what I wanted on a cool and rainy night. 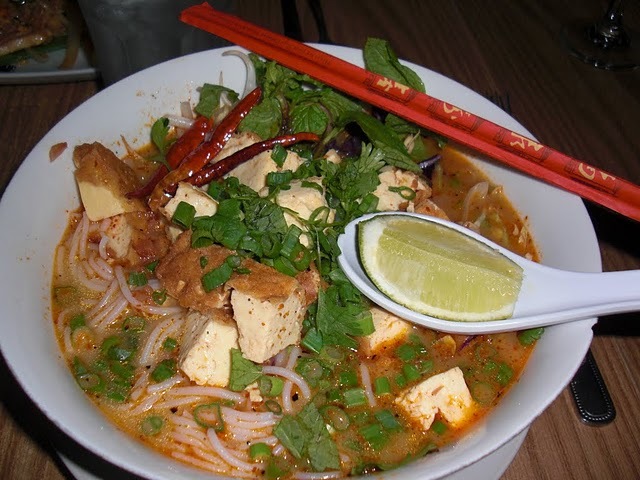 A coconut milk curry base with noodles, fried tofu, plenty of chilis and all the toppings of a traditional Pho. Perfect. Of course, I’ve had it twice again since I took this photo!